A Calgary retailer is hoping the recent bankruptcy and sale of an U.S-based confectioner will be money in the bank, for him. You know those little, chalky Sweetheart candies with cutesy words stamped on them like "Be Mine" and "Puppy Love"? Turns out that Necco, the American company that made them, has been struggling to balance the books for more than a decade. A bankruptcy last year, closed factories and deals gone bad followed by a sale to another candy company, Spangler, has led to a shortage of the candies. And that's where the owner of Sweet Fusion, Paul Yuzda, comes in. 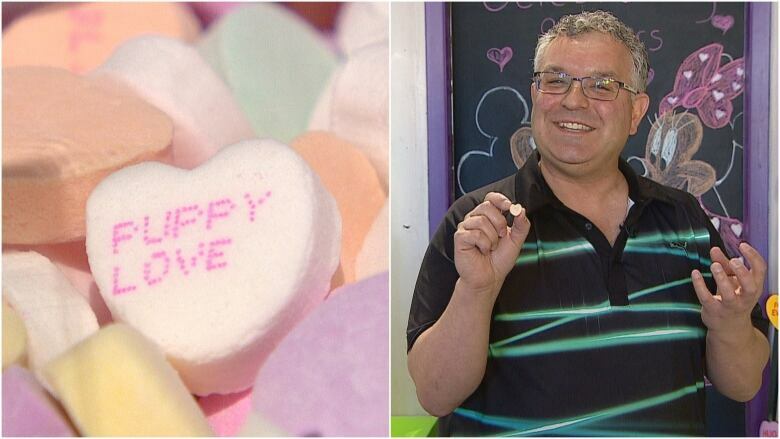 "Valentine's Day is obviously an important time of year for candy for loved ones," Yuzda told CBC News. "One of the staples in the candy industry has been conversation hearts, those little heart-shaped candies with stamps on them, like 'I love you.'" And Yuzda could see the writing on the wall, so he stocked up with the candies. He's hoping to capitalize on the nostalgia of the sweets. Necco was the product of several merged Boston-based companies, some that go back to the 1840s. "Obviously they are hard to find right now," Yuzda said of Sweethearts. "People know about them. They've been around. It's an important part of the candy industry." Once the dust settles with the new company, production of conversation hearts is expected to be ramped up by Valentine's Day 2020.